I did manage to limit myself to slowly sewing on some buttons and tacking up some sleeve hems today, so my Kid's Clothes Week is officially over. His T-shirt is the Figgy's Banyan T in the boy's T-shirt style. I picked up the Lisette knit at Spotlight in the discount rack, and I've just today spotted the pink colourway marked down. I might have to go back for that. 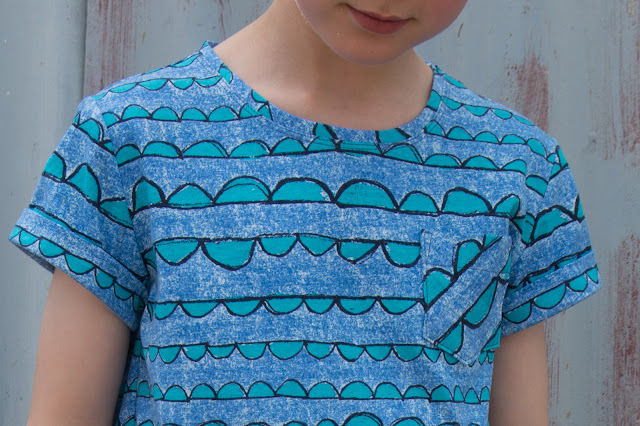 A T-shirt is a t-shirt when it comes to construction, but I always like to give a pattern it's fair chance to influence how I sew, so I followed the instructions. The pattern has you attach the neckband and then close the second shoulder. That's not my favourite way of doing things as I find it hard to get that narrow neckband to match perfectly - probably cause I'm using the overlocker to sew. The neckband is cut on the bias which I don't think makes any real difference to how it stretches and fits, but is perhaps designed for using stripes? Mine wasn't behaving all that nicely until I topstitched it down with the double needle. Now it's lovely. As an aside, if you're ever struggling with knit neckbands I would NOT recommend using the self fabric with a stable interlock like this. Reach for a good quality ribbing and you'll get a better result more easily. My other advice is usually to iron the beejezus out of it, but you saw where that got me yesterday! The T-shirt is size 8/9 which is the largest size this pattern goes to. I thought it was looking short and boxy wile I was making it, but I'm happy with how it looks on. I was worried he'd complain they were scratchy as the fabric is a fairly lightweight linen which I picked up as a remnant from The Fabric Store. It's got that 100% linen feel which can be a bit harsh, but it also has the most lovely olive colour and a slight sheen - almost a metallic surface look. I suspect I'd bought it for me but these shorts had to be made in a khaki type colour and in linen. Natch. Normally I'd back my sewing machine in any buttonhole challenge. Knit fabrics, thick fabrics, close to the edge of the fabric, bring it on! But the thick end of these narrow tabs that are only 1cm wide proved to be an impossible place to create a buttonhole. Fair enough, I can't fault her for finding that a bit too much of an ask. So the buttons are just stitched on. The faux fly construction was a new technique for me and I loved the way it came together. A few more steps than when the faux fly is incorporated into the front pants piece, but the finish is great. With all the edge and topstitching this was the slowest garment of the week, but I'd make another pair straight away I'm so happy with how they look on him. As at the end of every other KCW I'm now ready for bed and then to spend a few evenings just browsing the Project Pool and looking at everyone's wonderful creations. 'Til next time! Thanks! 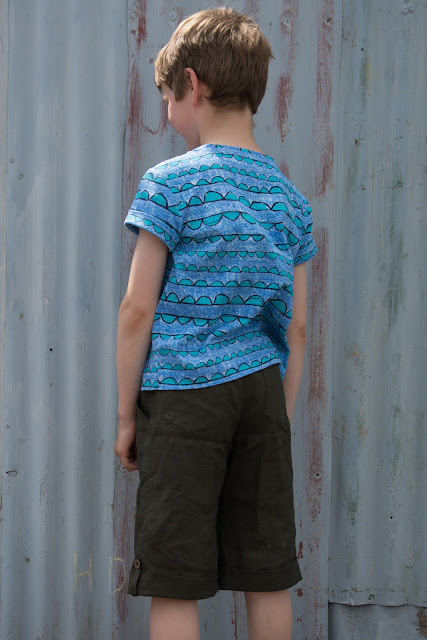 The temptation to keep the kids wearing old shorts cause the waistband still fitted had made me forget how cool they look when they're longer! That's really interesting, Shelley. That way of finishing a neckline is my very favorite. And yes, ironing knits is a MUST! The shorts are awesome, too! Dan's favorite punishment for Jude is to make him do pushups. It's not exactly a 'punishment', he started it as a way to get him to remember certain things - like not rocking on his chair at dinner time. So now Jude's getting good at them and is challenging me to join in. They are harder than one might think! There really is no right or wrong way is there. Just what works. Re the push ups, the former gym instructor in me wanted to correct his position, but I bit my tongue! 😃 yep, they're hard. My chest is currently sore as can be from Monday mornings weight training! 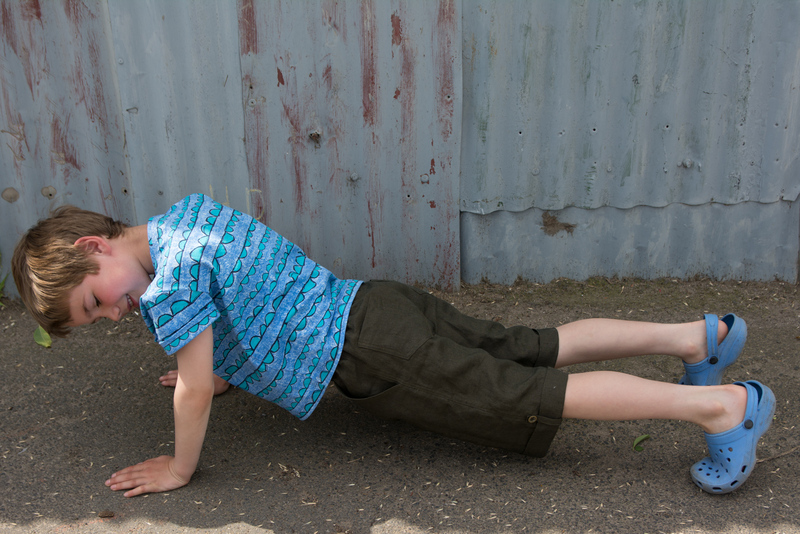 Why not show off a new outfit by doing a few push ups 😁 the tee looks great in this fabric. 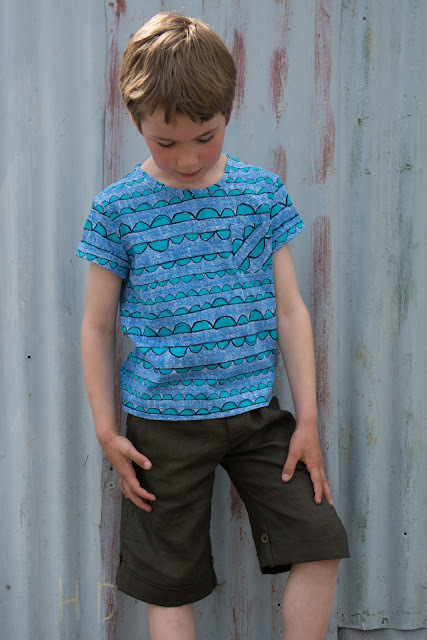 I love those knits for kids tees. I worked out I prefer to sew the shoulder seams together and then the neck and for the same reason. Seams that don't line up drive me crazy. Those pants are fab! Really need to look into getting some books for my girlies. There's nothing pro about our modelling shoots! And the outtakes have to be included sometimes, right?! I'm always delighted with my Japanese sewing endeavours. I need to delve into them more often. You're taking KCW by storm! I love longer shorts- so much better for little knees. 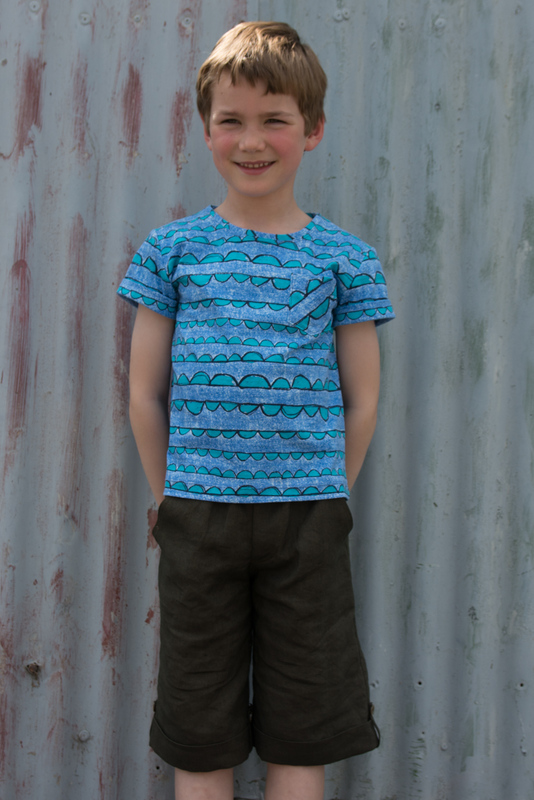 I've have to keep this pattern in mind when my little guy grows into the sizing. I can never sit it out, I swear something comes over me the night before KCW starts! There aren't many pattern books for boys, but the few patterns I've made from this book for P have been real winners. Highly recommended. Thanks Marisa, I was kind of cold on these knits when they were first released but the kids approved them so, on sale they seemed worth a try. I'm surprised by how much I like it made up too. 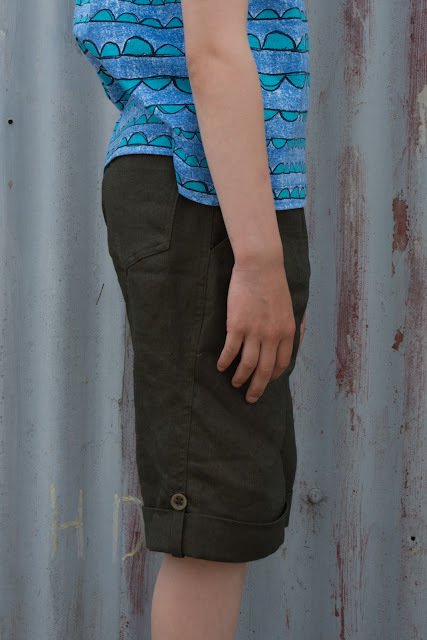 Would K fit the Thread Theory Jedediah shorts? They make a cool, slim long short. You are always so productive during KCW! The shorts are fab - the rolled cuffs are a great design detail. And I love seeing fun photos, good work P! Thanks! It's such a good motivation to crank out some useful clothes. What a great summer outfit! I love those shorts with their little tab! 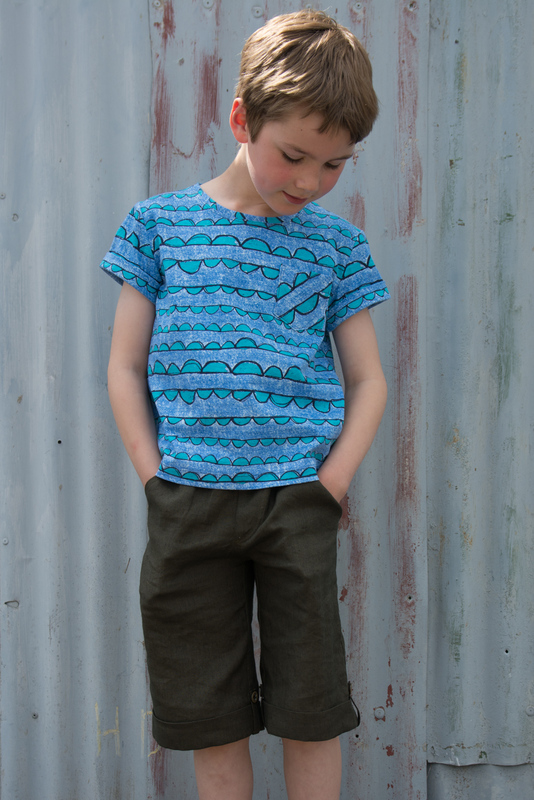 Great looking outfit for P, the t-shirt's pocket is fun and those shorts are pretty serious.